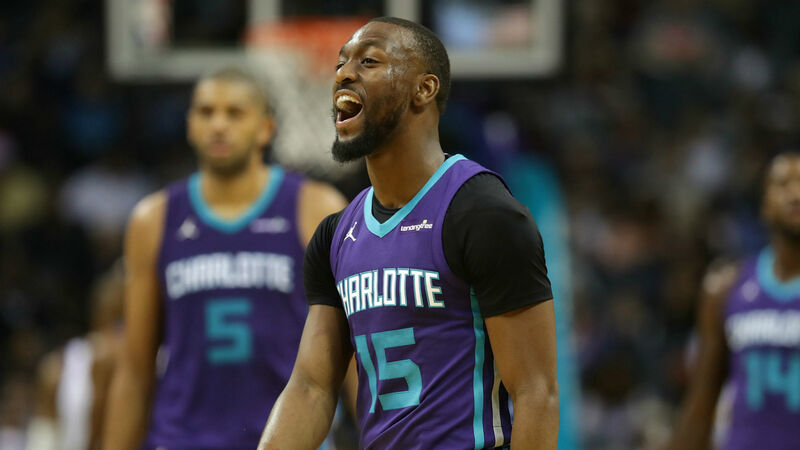 CHARLOTTE, N.C. — Before any reporter in attendance at Hornets media day could pose a question to Kemba Walker, the two-time All-Star made a polite, yet firm statement about the topic he knew he couldn’t avoid. In an ideal world, Walker would leave that room and any rumors about his status in Charlotte behind with an important season ahead for both the 28-year-old. But those free-agency questions will persist, even if they are not spoken within the confines of the Spectrum Center. Walker’s situation isn’t a product of uncertainty — quite the opposite. He made it clear Monday morning he doesn’t see himself signing with another franchise once he becomes an unrestricted free agent for the first time in his career. “This is where I want to be. I don’t want to be nowhere else,” Walker said. “You see guys wanting to leave teams and stuff like that. I don’t want to do that. I want to create something here, create something special here in Charlotte, something we’ve never had here. Consistency has been elusive for the Hornets over the course of Walker’s seven seasons in Charlotte. The win totals each year: 7, 21, 43, 33, 48, 36, 36. He endured the worst season in NBA history as a rookie with the then-Bobcats and has never made it past the first round of the playoffs. The only consistent part of the team is how much it relies on Walker to succeed. The Hornets held a net rating similar to the Spurs when Walker played and tumbled down to Kings-level incompetence when he sat on the bench. The Hornets recognized they couldn’t simply run it back for another year, hiring a new general manager in Mitch Kupchak and head coach in James Borrego while tweaking the roster by sending out Dwight Howard and bringing in Tony Parker. The franchise isn’t rebuilding, but rather, as Borrego says, “establishing a new identity.” And Walker is very much a part of that identity. Parker, who left the Spurs largely because of the chance for more minutes with the Hornets, will run the second unit and look to avoid those precipitous drops that have plagued Charlotte when Walker sits. An additional playmaker along with an emphasis on pace and quick decisions could take the offensive burden off Walker’s shoulders. Still, there are reasons to be skeptical. Parker is coming off his least productive season (7.7 points, 3.5 assists per game) since his 2001-02 rookie campaign. Nic Batum has disappointed after signing a massive five-year, $120 million deal in 2016. The roster is full of unproven players, and executing Borrego’s vision will take time. The Hornets don’t have the benefit of time. Walker doesn’t want to leave, but he also is tired of missing out on the postseason. If Charlotte is suddenly sliding down the standings midway through the season and leaning toward another lottery pick, will Walker re-evaluate his options? Parker joked that the Hornets better not ruin his playoff streak (“17 in a row”), but there is much more potentially on the line if Charlotte fails to capture one of the top eight seeds in the East. Even for a player as loyal and committed as Walker, there could be a line when the losing becomes too much. For now, Walker’s only concern is putting the Hornets in position to make a run at the playoffs. He hopes the rest will take care of itself. At media day, Walker was unwavering in addressing the 2018-19 season and beyond. But the biggest questions will come when the Hornets take the floor, and the answers could alter the futures of Walker and the only franchise he has ever known.